Thanks for your great feedback and input. I wanted to start a fresh post, and share the changes with you. Logo icon nose changed to be more "correct"
Ironically this brand was created in this style FIRST - Jeff's minimalist observation must have telepathically transferred. I did draw upon the idea of "citation needed" here. So maybe this meets both the minimalist (+1 for me: I like modernism) and some identifiable mark (+1 for a unique ID). I also like having things like "fun" and being "awesome"... So we can still use the gears for badges, details. Here is another take on it I put together in response! I'm going to echo the comments made by many others: I'm not too good on the yellow. I think the design is great as it is, but I would prefer if another color than yellow was used instead. It's a very aggressive and taxing color. I would prefer if a colder, like blue or green, was used instead. I've made 3 more versions with less saturation and different hues. Definitely use less saturation, in my opinion. Similar to the previous version. Click for full res. This tone of green reminds me of medics. Click for full res. Tone of blue to indicate clarity of vision and authoritativeness (although I'm skeptical of that). Click for full res. Over all, this design is an improvement over the last one, from a sheer concept standpoint, but there are still remaining issues. The color of the logo is okay. It's eye-catching without being too bright on its own; however while I like the concept of the logo, I am not sold on this version. It certainly looks more like a person now, but with the tilt of its head and the angle of its torso, it looks very sad. Perhaps if there were a something like a hand in front (ala The Thinker), it would have a different feel. You mentioned that you had several versions in the works. Any chance that we could see some of the others? 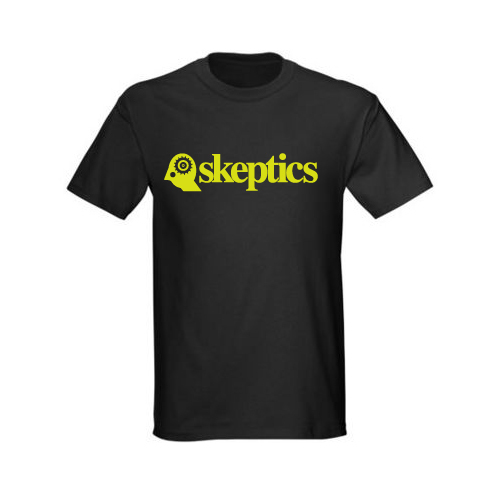 I like that "skeptics" is written in lowercase. It separates us from the conspiracy nuts, and feels inviting. The concept for the background is great. 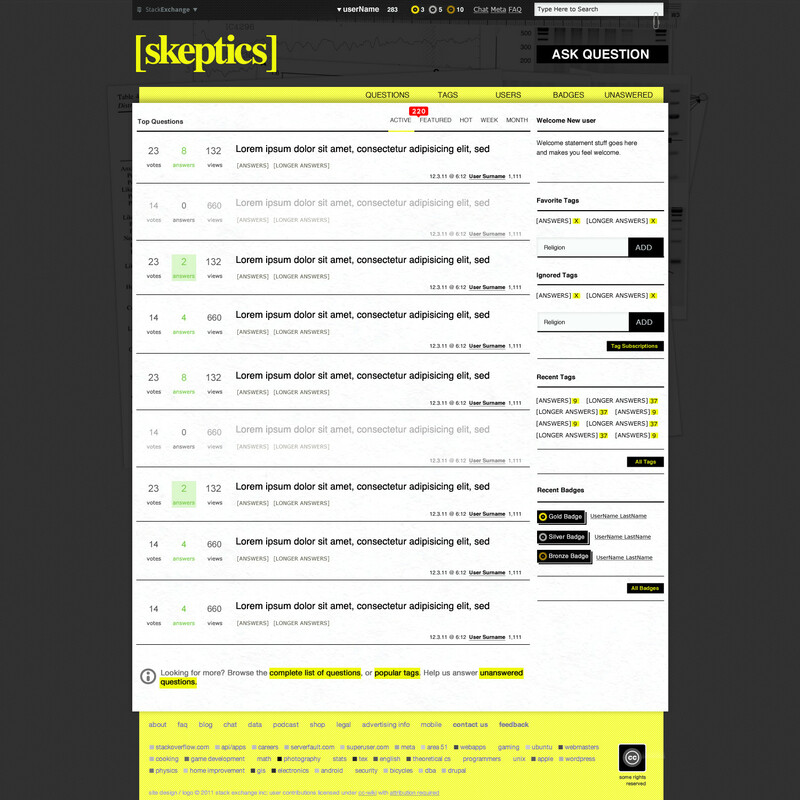 I like that it contains scientific papers, and that they are muted so as to not compete with the content. It works as a concept, although it seems a bit dull. Is it possible to have several different backgrounds in a similar style that can be cycled through? If we have to look at that same graph all the time, it seems like it would get tiresome. Also, I don't know if it is just a matter of the preview image or not, but the background suffers from JPEG artifacts pretty bad. I assume that that is just a matter of the preview image, but if not then that should be changed. I like that the color palette is restricted, but I don't know if the yellow and lime green are the best choices. The color at the top of the page works well enough. 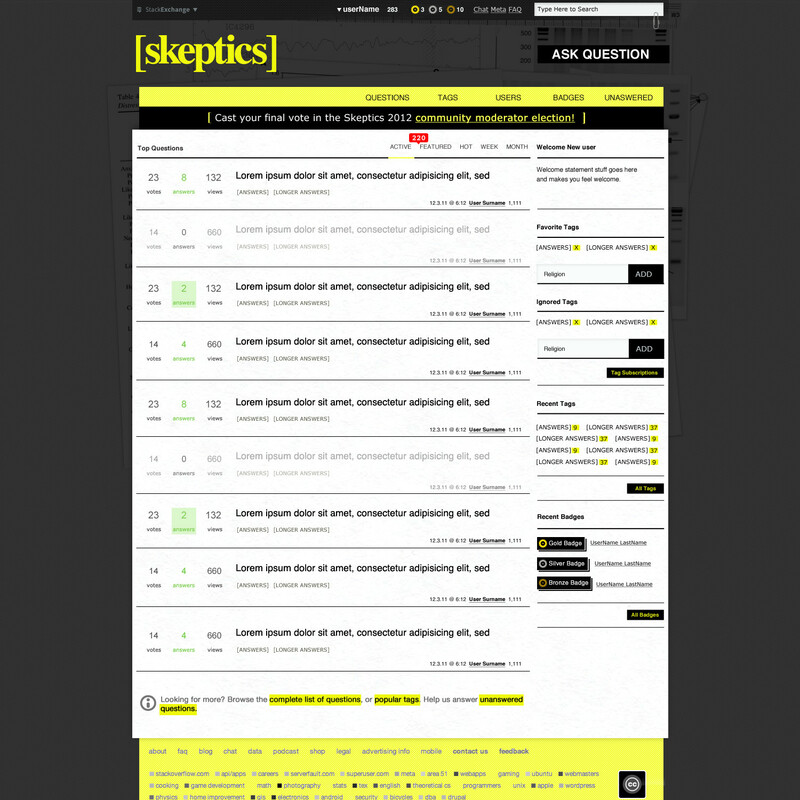 The yellow appears to be more muted here than the rest of the page. 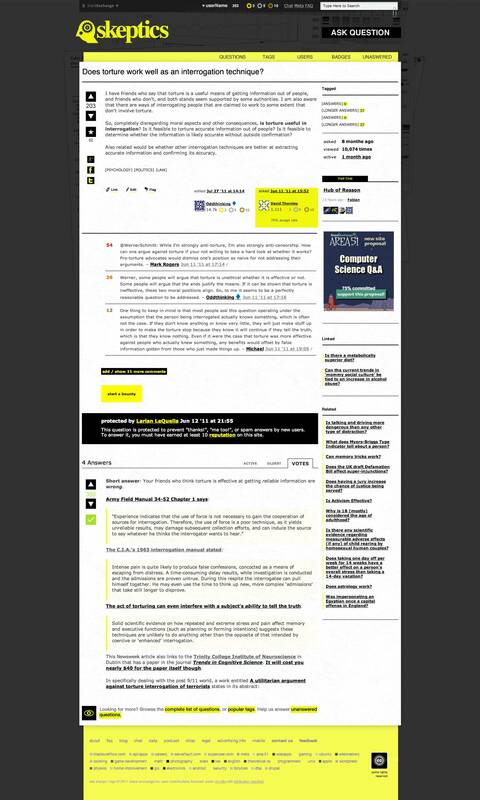 It contrasts well with the darker gray of the background; however when this is reversed on the bottom of the page, it becomes difficult to read the text against the yellow. I generally do not like the way that the yellow is used throughout the site. It's a very attention-grabbing color, and seeing it on Xs, numbers, quote lines, and as the background for the author info box is very jarring, as they are less important to me than other areas of the site. I would reserve it for VERY rare cases, and places where it is vitally important to draw the attention of the user. The green on the white doesn't have enough contrast. It should either be darker or more saturated to make it more visible. It basically looks like the questions with answers are less important than the ones without. Helvetica and Verdana are good choices. The icons are clear, and look like buttons. I just don't like the yellow in the activated states. The only issue that I have with the merchandise is related to the logo. I love the last shirt. Several people have suggested the yellow is too bright; I agree. Jin's suggestion about zooming in did seem to help. However, there are actually at least two different yellows, which might be confusing matters. The "Start A Bounty" and David Thornley's User Badge are different yellows. I'm taking a contrary view to Jeff Atwood here. I like the gear head, now that he (?) is in no risk of drowning in the first rain shower. Yes, gears may be used a bit, and "get your brain into gear" is a common phrase, but I certainly don't roll my eyes at the cliche when I see it. 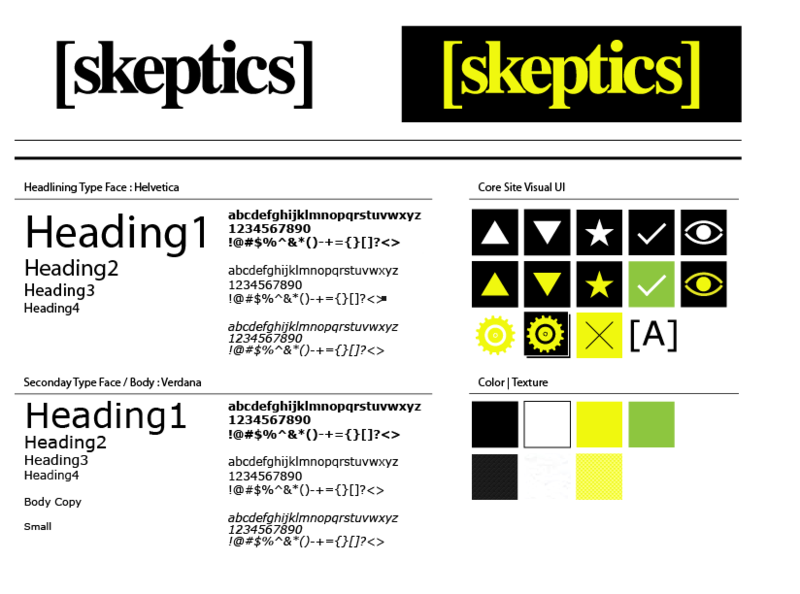 My first reaction to the new Skeptics word mark was that it was too simple. Without meaning to belittle the art of good design, it is just a word with some very tight keming. 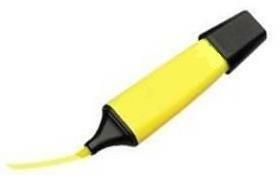 Without the Newton Gearloose (Okay, okay, I am just throwing the name out there!) image, it would be more than merely clean. It would be dull. If the gear head does go, can we please have a more interesting word mark? I like the improvements a lot. The overall design is cleaner and sharper which I think is a better representation of what the site is about, although I cannot exactly articulate why. 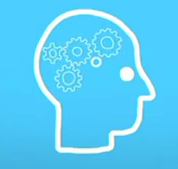 I still think the gears-in-head icon is too generic. The idea of gears in a head is quite common and used for things from training seminars to engineering to writing. 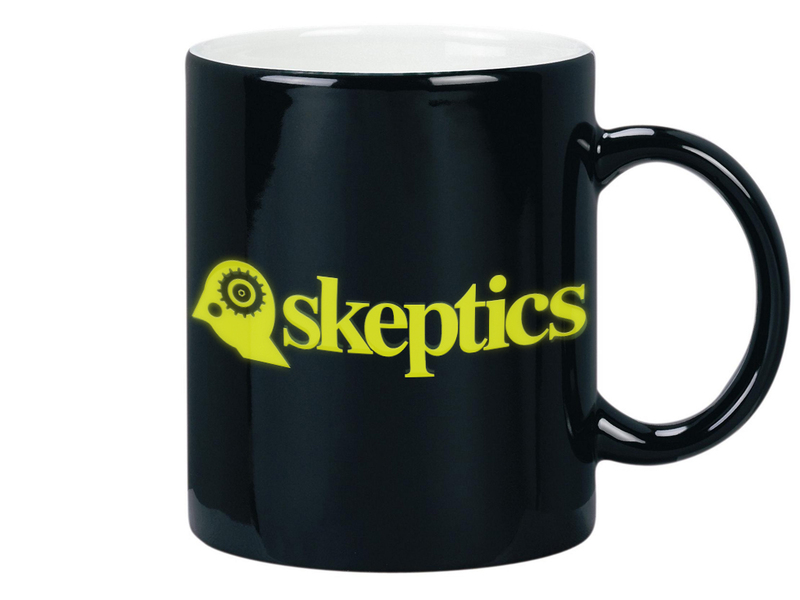 Nothing about it clearly says skeptics. 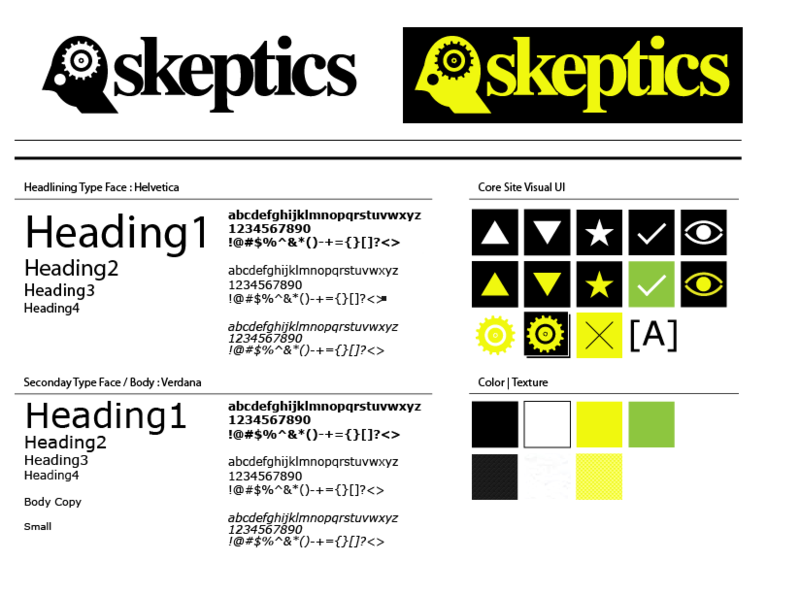 A logo that had a few elements of things characteristics of skepticism would be more apt in my mind. The previous question has some good suggestions in the answers, things like a magnifying glass or a citation or perhaps a well known skeptics issue, like the UFO in the Skeptic Magazine logo. I really think the idea of a light design is important. It's hard for me to imagine using the site with a dark grey on the sides, rather than a lighter color with perhaps a darker logo. I think the idea of shining a light on issues is important, although I don't know if that translates to design well. I feel that it may and would do more to distinguish us from conspiracy sites which in my experience, tend to be dark. If sticking with the head logo, perhaps make it less abstract? Show a mouth or some hair or something. 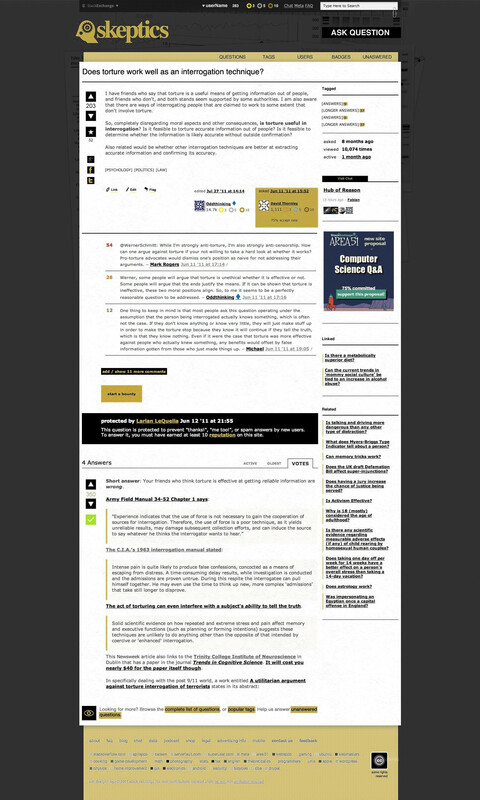 I think this would make the site look more refined, which is also a better representation of the community having higher standards than is typical. Just a few suggestions. I'm looking forward to see how the design progresses. The meaning of the current appearance - just number by itself - seems unclear. People said the gearhead was too cliched. I disagreed, I liked it and was sorry to see it go. I guess they were right after all. Much better! I like it! 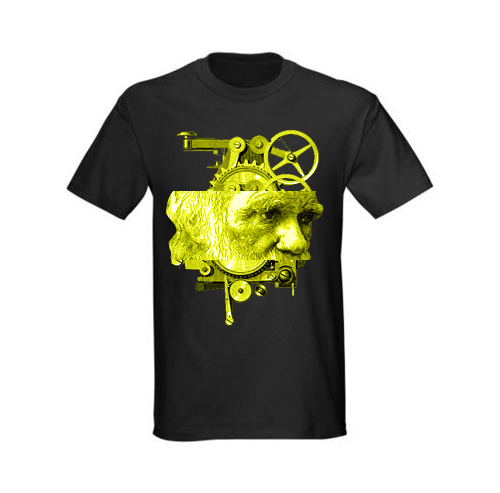 One suggestion, I think it'd be cleaner if we dropped the gearhead. That part is still IMHO a little too whimsical for the tone of the site (it's also a bit steampunk looking). The "just text" logo is clean, simple, and to the point -- much like scientific skepticism itself.